Are you planning to book a conference in Stockholm's Archipelago? The archipelago consists of about 30,000 islands, most of which are uninhabited. On numerous islands and on neighboring mainland there are a variety of nice conference facilities. In relation to the number of residents in the archipelago, the conference facilities are large. For the archipelago is one of a kind and really a popular meeting environment. Nature is unique, the journey to and from the resort is an experience in itself. In smaller establishments the group can dispose of the entire facility itself and the possibilities for exciting conference activities are very good. The overall experience of a conference in the archipelago is therefore strong and puts a permanent impression on the whole meeting. In the archipelago there are a number of, usually smaller, facilities on islands to which the participants take a boat. These facilities are often family owned and characterized by personal response and high commitment. 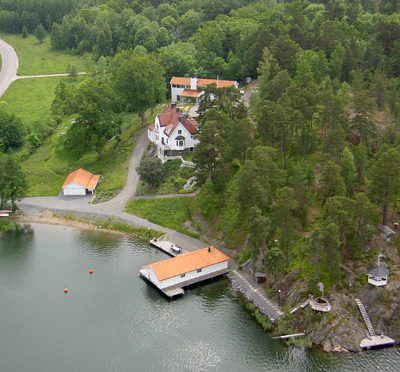 One example is Grinda Värdshus in Stockholm's middle archipelago. The facility is suitable for smaller groups who wish for a formidable dining experience. The island of Grinda is reached by boat, about an hour and a half from Stockholm City. Classic, yacht-inspired hotel Sandhamn Seglarhotell. is located in Sandhamn. Sandhamn is a cute little "society" with restaurants and shops - and one of the biggest samll boat harbors in the archipelago. For smaller conference groups, Sands Hotell is an interesting alternative. Further south lies the island of Utö with Utö Värdshus - a scenic and at the same time "living" island with lively boat traffic and a lot of tourists. Elegant Djurönäset is a unique venue in several respects. This conference hotel have more than 250 hotel rooms and conference rooms for over 400 participants. At the same time, the facility is also nice for smaller and medium-sized groups who have the opportunity to live and hold the meeting in an "own" house. Built out over the water in Nynäshamn is another high-class facility - Nynäs Havsbad. Both Djurönäset and Nynäs Havsbad can be accessed by car. By the shores of Baggensfjärden you find Artipelag - an architectural feast where the building fuses perfectly into the "rough" archipelago nature and no detail in the interior has been left to chance. Artipelag has room for really big events with up to about 1000 participants. A nice and affordable facility is Lillsved which lies beside the water on the island of Värmdön, where the shipping routes by Saxarfjärden and Lindalssundet meet. The facility has great accommodation and conference capacity and is perfect for groups wishing to combine a conference with outdoor or indoor sport activities. The archipelago feeling can also be found closer to Stockholm. At Lidingö for example, there are a number of very nice conference facilities. One of these is high class Skogshem Wijk, which is also one of Stockholm's largest independent conference facilities. The archipelago is not only suitable for summer conferences. Most facilities are open all year and a winter conference in the archipelago definitely means a different experience. 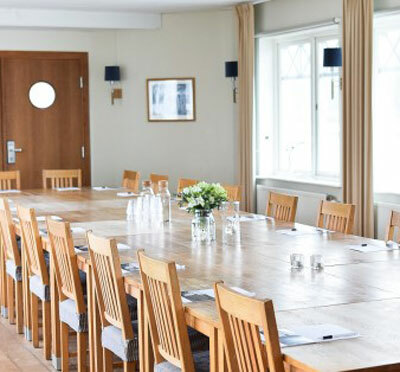 Swedish nationwide conference agency, Kontur Konferens AB, provides effective assistance with tips, recommendations, price comparisons and booking of a conference in the Archipelago. We also assist you with booking boat transport and conference activities.